Creamy, chocolatey cheesecake. Scrumptious, chocolate-cookie crust. Yup. This one's for the chocolate lovers out there. You know who you are. Beat cream cheese, sugar and vanilla in large bowl with mixer until well blended. Add chocolate; mix well. Add eggs; mix just until blended. Pour into crust. Bake 40 min. or until center is almost set; cool. Omit crust. Line 8-inch square pan with foil, with ends of foil extending over sides. Crush 18 OREO Cookies; mix with 1/4 cup melted butter. Press onto bottom of prepared pan. Prepare cheesecake batter; pour over crust. Bake and refrigerate as directed. Use foil handles to lift dessert from pan before cutting into bars. Makes 16 servings. Prepare as directed, using one of the following flavor options: Mocha Cheesecake: Stir 3 Tbsp. 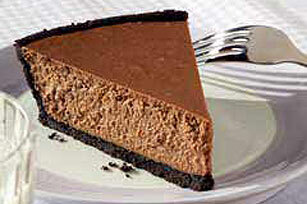 coffee-flavored liqueur or cooled brewed MAXWELL HOUSE Coffee into cheesecake batter before pouring into crust. Black Forest Cherry Cheesecake: Spread 1 cup thawed COOL WHIP Whipped Topping over cheesecake just before serving. Top with 1-1/2 cups cherry pie filling mixed with 1 Tbsp. cherry-flavored liqueur.